Get your resume in shape for new construction projects. Check out this sample for nuts-and-bolts guidance. Do you have all the necessary tools for a successful job search? You need to start by building a resume that positions you for the best construction manager jobs. Hiring managers want to see not only your skills and experience, but also the value you'd bring to the job. 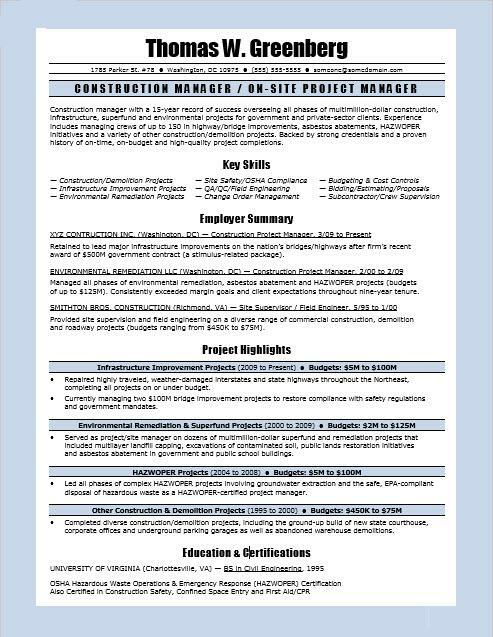 For guidance, view the sample resume for a construction manager below, and download the construction manager resume template in Word. Jobs for construction managers are projected to grow by 11% (or 44,800 jobs) from 2016 through 2026, which is faster than average, according to the Bureau of Labor Statistics (BLS). You'll find the highest level of employment for this job in the following states: California, Texas, Florida, New York, and Illinois; and in the following metropolitan areas: New York City, Houston, Chicago, Los Angeles, and Dallas. As a waitress, you can expect to earn a median wage of $91,370 per year, or $43.93 per hour, according to the BLS. Additionally, you can learn more about construction careers on Monster. Construction manager with a record of success overseeing all phases of multimillion-dollar construction, infrastructure, superfund and environmental projects for government and private-sector clients. Experience includes managing crews of up to 150 in highway/bridge improvements, asbestos abatements, HAZWOPER initiatives and other construction and demolition projects. Backed by strong credentials and a history of on-time, on-budget and high-quality project completions. award of $50M government contract. of up to $125M). Consistently exceeded margin goals and client expectations throughout tenure. and roadway projects (budgets of up to $75M). Repaired highly traveled, weather-damaged interstates and state highways throughout the Northeast, completing all projects on or under budget. Currently managing two $100M bridge improvement projects to restore compliance with safety regulations and government mandates. and asbestos abatement in government and public school buildings. Led all phases of complex HAZWOPER projects involving groundwater extraction and the safe, EPA-compliant disposal of hazardous waste as a HAZWOPER-certified project manager. Completed construction and demolition projects, including the ground-up build of new state courthouse, corporate offices and underground parking garages as well as abandoned warehouse demolitions. The foundation of any successful job search often starts with a rock-solid resume on which to build your candidacy. Could you use some help hammering out the details? Get a free resume evaluation today from the experts at Monster's Resume Writing Service. You'll get detailed feedback in two business days, including a review of your resume's appearance and content, and a prediction of a recruiter's first impression. Think of your resume as a blueprint of your career—one that will grow increasingly satisfying with each new job.